With four children, Mary Ellen had hopes of all of her kids attending the same Catholic elementary school. 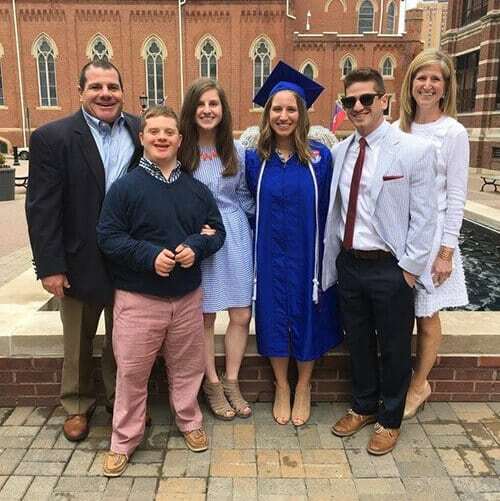 Thanks to St. Anthony School Programs, it was possible for her son with special needs, Charlie, to attend St. Thomas More with his brother and sisters. Now 20-year-old Charlie is attending his second year of St. Anthony’s Duquesne University program. He’s learning life skills and how to manage Pittsburgh’s transportation system, and he’s gaining work experience. He’s also able to enjoy a normal college experience with plenty of opportunities to interact with other Duquesne University students. Actually, Charlie was able to continue attending school with a sibling, as his sister just graduated this year from Duquesne University with her Bachelors in Education. Partly inspired by her relationship with Charlie, his sister will go on this fall to get her Masters in Special Education. For Charlie, he’ll attend his final year of the Duquesne University program next year. Mary Ellen is starting to look toward his future and knows the skills he’s learned through St. Anthony will help him through this next stage in his life. Mary Ellen encourages other parents in a similar situation to consider St. Anthony School Programs for their child.